The Shetland Isles lie at the northern tip of the UK – a group of 100 islands of which 16 are inhabited. 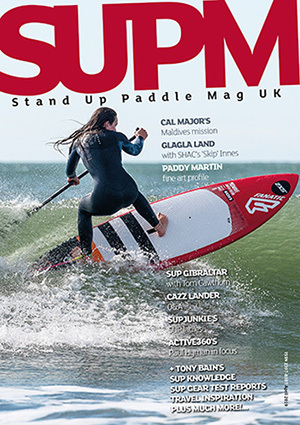 After flying to visit my wife, Annagail’s family in the Shetland Isles for the first time two years ago; the thought of going back, this time with SUPs and exploring the islands grew with intensity. With the purchase of two new Red Paddle iSUPs from Reactive Watersports in Plymouth, we made a trial run to Roscoff (France) over Easter to see how we could fit the two inflatables into the estate car with all the usual holiday stuff. It worked well so an expedition to Shetland was planned – to visit the three main islands exploring hidden coves, surf and view some fantastic wildlife. We completed the 600-mile drive from South Devon to Aberdeen in two parts; with a night at Killington Lake Day’s Inn on the edge of the beautiful Lake District. From Aberdeen we had an overnight 14-hour ferry to Lerwick on Mainland Shetland. This was broken up by a stop at Kirkwell (Orkney) to drop off and take on-board new passengers. Pleased to say this was a reasonably flat crossing! 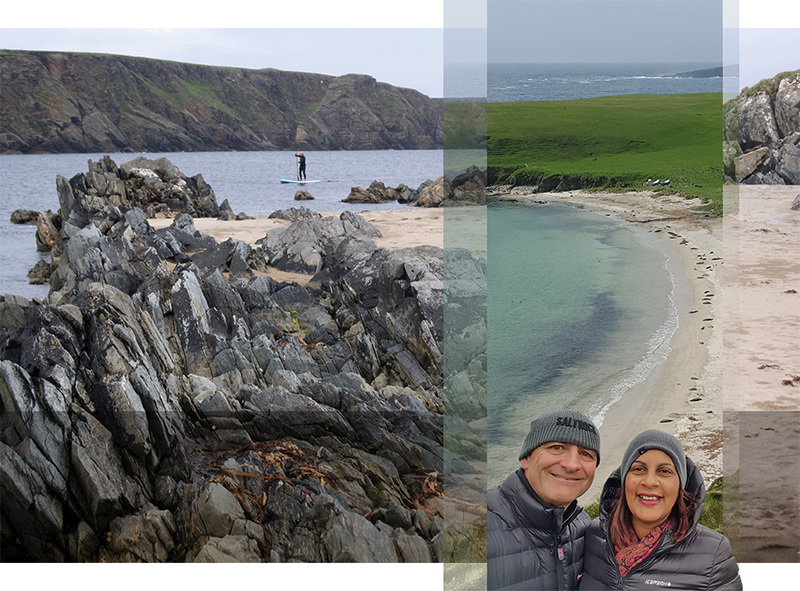 After spending a couple of days again enjoying the wonderful hospitality of family, we headed to the most southerly point, Sumburgh Head, and to see the famous Puffins. Then heading north along the south-western coast we checked out the beaches and spotted some small surf at Quendale. 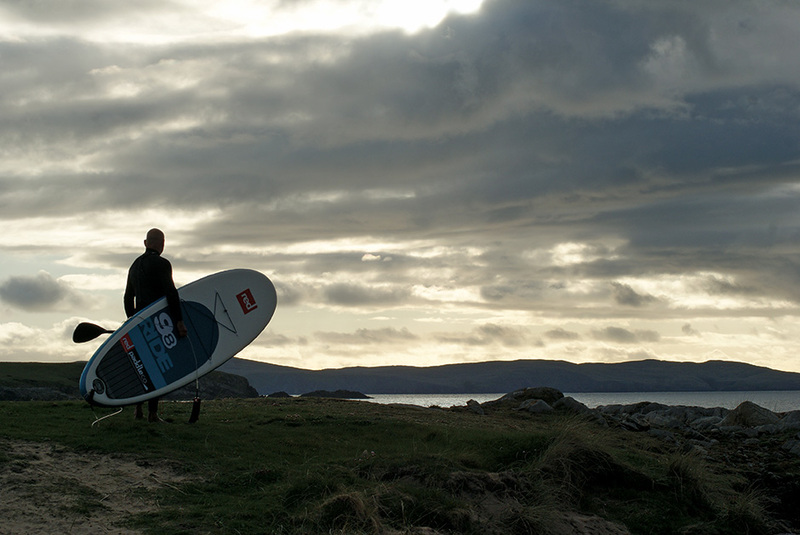 After some ‘surf talk’ with one surfer on the deserted beach, we decided to head up to the iconic white sanded St Ninians Isle which we knew was likely to have both waves and flat water caused by the division of the causeway. The drive down the hill to the car park didn’t disappoint and the weather was kind with light winds and some sunshine. 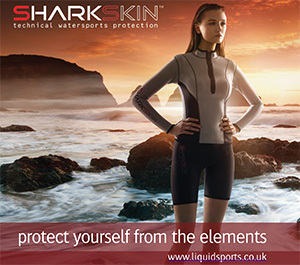 With SUPs pumped up and with our summer steamer wetsuits on, we descended onto the beach to the southern side of the causeway. Paddling here on the clear flat water with Red Throated Divers and diving Terns for company was therapeutic after the distance we had travelled from Devon. I swapped over to the other side of the causeway after 30 minutes and played with the small surf. We had the 9.8 and the 10.6 versions with us. 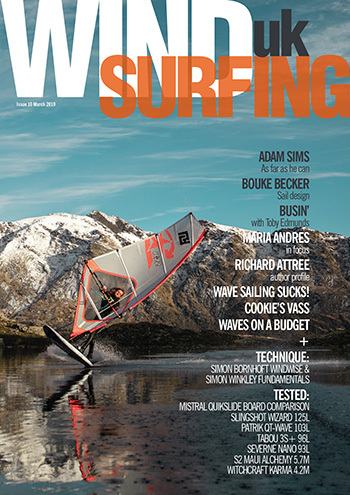 I was pleased how the 9.8 would both tour and take on the small surf, especially with my six-foot two-inch frame and 88kg mass. The next day we took two ferries to get to Unst, the most northern isle. We did a six-mile circular walk to view Muckle Flugga, which is close to the most northern point of the UK, a spectacular site with thousands of breeding Gannets and spray shooting skyward from the wild sea battering the coastline. Strong westerly winds ruled out any SUPing today although some of the more sheltered spots (Burra Firth in particular) did look inviting. The endless options to paddle again, no launch or parking fees and only ourselves for company was very tempting. Driving around the following day looking for Otters (unsuccessful again) and this being our last day on Unst, we searched for an opportunity to paddle again. Strong winds were with us again but died down in the evening. We headed to Norwick which is arguably the most northern beach in the UK and where there was flat water. 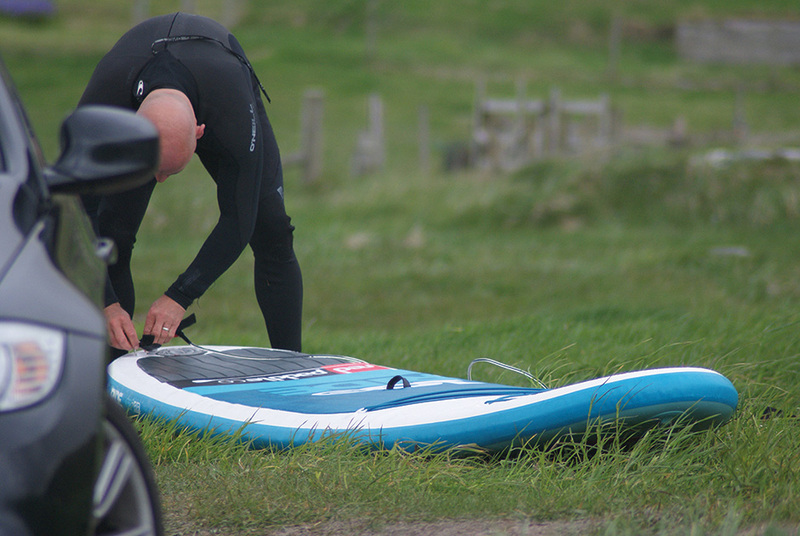 After a quick change and inflating the board, I took Annagail’s SUP – the 10.6 out for a cruise around the bay, with only a curious seal shadowing me and Great Skuas passing overhead for company, while Annagail took photos. The next day we caught the ferry south to Yell where we would stay for two nights. We checked out the top part of the island and found a nice north westerly beach (Breckon Sands) requiring a small walk down and across a field of sheep. Another great location was the Gloup Voe (tidal inlet) which was sheltered from the breeze and occasionally threw up a small wave at the mouth. As with any new place, care must be taken all around these islands. The continuous change in weather and the strong tidal currents meant we would watch first to evaluate and keep monitoring the conditions. Our next accommodation was on the west of the island at West Sandwick, a short distance from another great white sandy beach. After dinner, we walked across the fields to the beach. 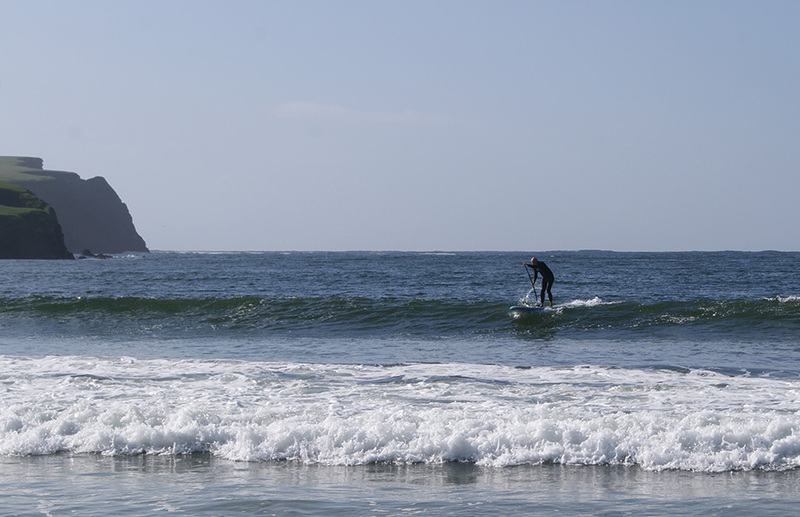 A nice ‘wind-blown’ swell created a 1-2ft wave, striking in the evening sunshine. Tempting but we decided to return the following day and search for Otters again instead. Persistence pays and we were finally rewarded with close-up views of a family of three by the Ulsta ferry terminal. Our second day on Yell took us to the North East of the island and to explore southward along the east coast. We found a gem of a spot at Vatster where you can drive down to a small causeway which separated the beach from a Loch. We talked with a ‘local’ originally from Norfolk, who had set up a small business selling candles to tourists and she told us where to find Otters and Puffins in the area. Tempting as it was, we moved further south and chose a sheltered beach at Gossabrough facing the north east. We had a comfortable 300-metre walk before we could launch and this gave us the opportunity to try out the Red Paddle rucksacks which we bought as a package including leash, paddle and Titan pump. coastline keeping an eye out for the shy Otters. 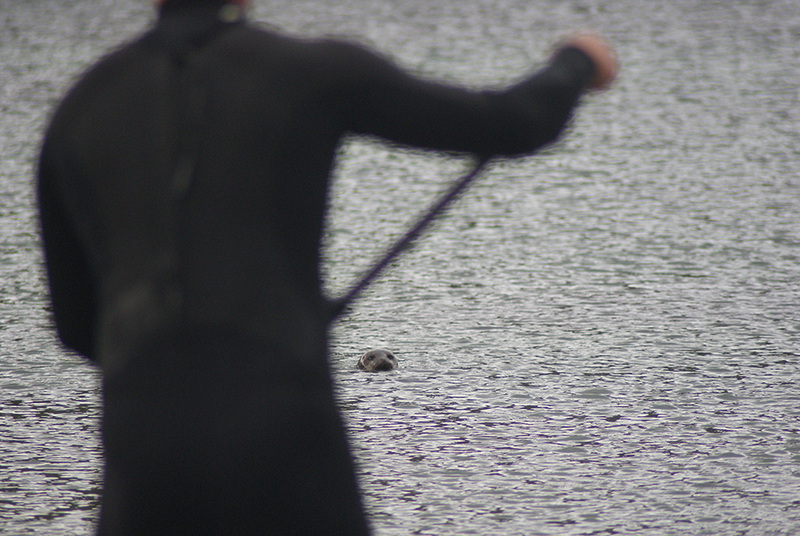 Black Guillemots and Seals were our constant friends but always kept their distance. With the arrival of rain, we finished our tour on the flat water and returned to the beach, quickly deflating the SUPs and packing them easily into the rucksacks. With the car thermometer showing seven degrees, we headed back to the B&B for a welcome warm shower, cup of tea and plate of homemade soup from our friendly B&B owner. Such a beautiful location it was hard to resist one last SUP on West Sandwick, so with the sun still up on our last evening on Yell, I had one last paddle. Although the swell was not as big as yesterday, there were some small waves to catch and it felt great to have the sun on your back and be the only people on the beach again. Mission accomplished we returned to the mainland the following day and enjoyed more time with family. We had great fun at one of the many music nights on the islands which are basically locals jamming sessions with fiddles, accordions, flutes and many other instruments that lasted until midnight. All too soon our break came to an end and it was time to catch an evening ferry from Lerwick back to Aberdeen. Unlike our arrival this was a ‘lively’ crossing! 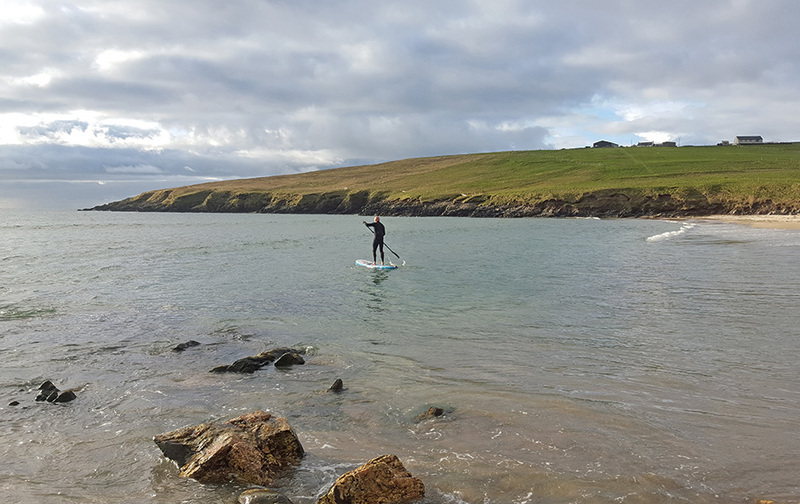 We enjoy touring the south west England coastline, socialising with fellow paddlers, sometimes competing with our SUPs but we’ve found they’re also really great for exploring. There’s no doubt we’ll be back to Shetland but now, who knows where else we’ll explore!